Basilar invagination. Labelled artwork and corresponding sagittal magnetic resonance imaging (MRI) scan of an injury known as basilar invagination. 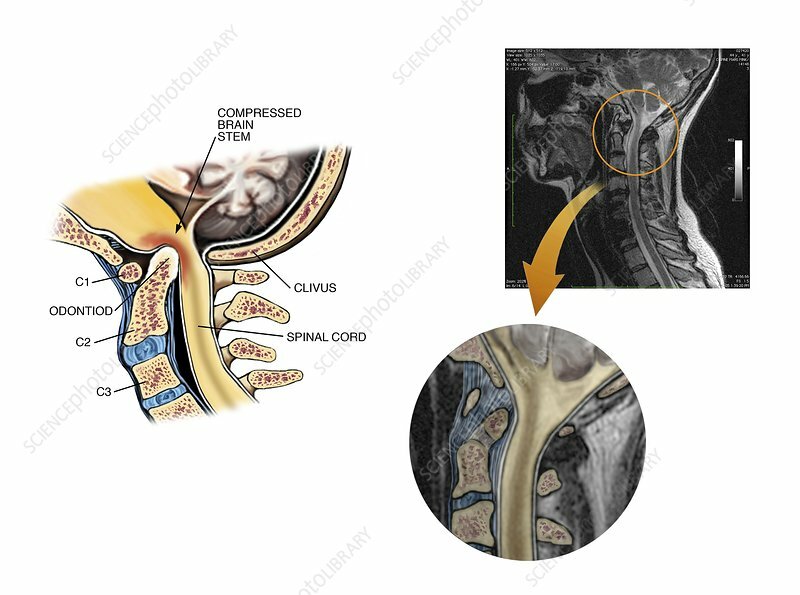 This is the upward protrusion of the odontoid (top of the C2 vertebra, labelled at left) into the foramen magnum, the space at the base of the skull where the brainstem and spinal cord emerge. This protrusion causes severe compression of the brainstem, which can cause a range of symptoms including neck and head pain and weakness, and dizziness. Cervical traction may be needed to correct the condition. A detail of the MRI scan is at lower right.